Was it a relative, a movie, or a chance encounter on the water? Whatever got you into the sport will leave a lasting impression. 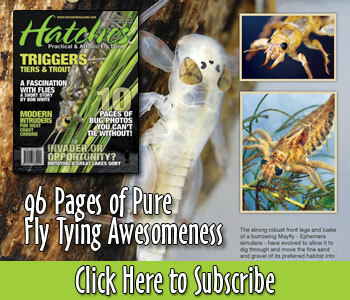 Go to our facebook page www.facebook.com/pages/Hatches-Magazine and share your story. Next week we will choose 3 winners (1 with the most likes, and 2 at random) to win a prize pack from Scientific Anglers. I started at the age of ten. I’m now 51 doing pretty good. met a yank in the uk who got me into fly fishing. there are thousands of flies and they were all just hooks in disguise to me so i went to tying classes to learn the names of some of them and by tying my own i’d save money, right? I was 10 when Clayton Peters, an older gentleman whose son was gone, observed me attempting to cast a fly with a casting rod. He called me to the side of the stream and gave me some flies and pointers. That was the beginning of a life-long friendship. He was my mentor who taught me how to tie flies and build rods. I am 74 now and I teach fly tying and rod building to adults and children. I think of it as “PAYING IT FORWARD”. Whenever I find stress in my life, I can always find comfort at my vise! Thirty years ago, while spin fishing the Little Lehigh Creek in Allentown, Pa I watched as numerous trout rose to emerging mayflies (had no idea what they were at the time). Frustrated, I went back to my car where I had a deer hide in the trunk. With no fly tying experience I tried to use monofilament to attach some deer hair to a bait hook. As you might expect, my feeble attempt at fly tying was a failure. Even if I’d have been able to create a “fly”, I had no idea how I would have presented it to the rising fish with my five foot ultra light spinning rod. This experience quickly led to a purchase of a fly rod and shortly thereafter I was deeply entwined with nature on the trout stream. I grew up with out a lot. My best friend and his dad got me into fly fishing when I was about 10. I never had more then 5 or 6 flies, so we made them out of the rubber band like material in a golf ball. Now I’m teaching my step grand kids, and they love it. Nothing like seeing their face when they catch a trout with a fly they tied. It’s one of my favorite ways to relax, sitting at my tying table. Lucky for YouTube. Videos galore, and no humility in watching and watching and watching and watching. The MAGIC and ELEGANCE of The Perfect Loop discovered. Bass… caught. And caught. And caught. It’s one thing to catch flies purchased, but it IS really something to tie your OWN fly – no matter HOW lame and stupid-looking – and actually CATCH a fish on it! No words can describe that feeling. Once it hits, THAT too becomes a life-long passion wherein one is both student and teacher, ever learning, and ever quick to pass on tips & techniques to those around us. That was my 40’s, and this year I turned 50. When I spin cast fish, it’s still fun, and there IS a reward in the perfect cast to the perfect location with the perfect retrieve watching the humongous under-bow-wave approach your lure, and the perfect massive pull/tug on the line…. November of 2009 I was laid up in a hospital recovering from a major surgery. It was 11:00 P.M. on a Saturday night and I could not sleep. I decided to go look for something to read and walked my IV down to the lounge area where there were magazines laying around on a small table. I spotted a Southwest Fly Fishing and a Field and Stream magazines and picked them up to take back to my room. I had never fly fished before and had not fished in years. I read the Southwest Fly Fishing magazine cover to cover and the articles about fly fishing in Field and Steam and vowed when I got out of purgatory I would go fly fishing. I bought my fly rod and reel combo from BassPro a month later and practiced casting at home. I went fishing the end of January and learned many valuable lessons on what not to do. Having acquired all the fly fishing equipment I finally caught my first trout on my third outing on the Blue River in Southern Oklahoma. The rest is history. Since I have retired fully now I average a little over 100 days a year fishing using fly, spinning and baitcast rods and reels. I even make my own flys. Too bad I did not take up this hobby and passion until I was 64 years young!